When it comes to going out in the Garment District, you always want to look outstanding. Your hair is curled to perfection, your outfit is right on point with recent style trends, and your handbag is all the rage this season. Obviously, you had a lot to focus on but you may be disregarding a very important feature that could make all the difference and can take you from drab to fab. My dear, we are talking about your eyebrows. Eyebrows are an essential facial feature and we know executing the perfect brow is sometimes a struggle. If you aren’t maintaining your brow, it could be wild and untamed, if you are over abusing them they can look too thin or over-plucked; where’s the balance? At Unique Threading salon in the Garment District, threading is the name and strong, beautiful, and perfect brows are our game. We have professional and experienced eyebrow technicians ready to use age-old techniques to give you amazing eyebrows. Threading is a way to maintain eyebrows by removing hair in such a precise manner. While threading is a great way to obtain magnificent brows, there are many rumors running through the mill. 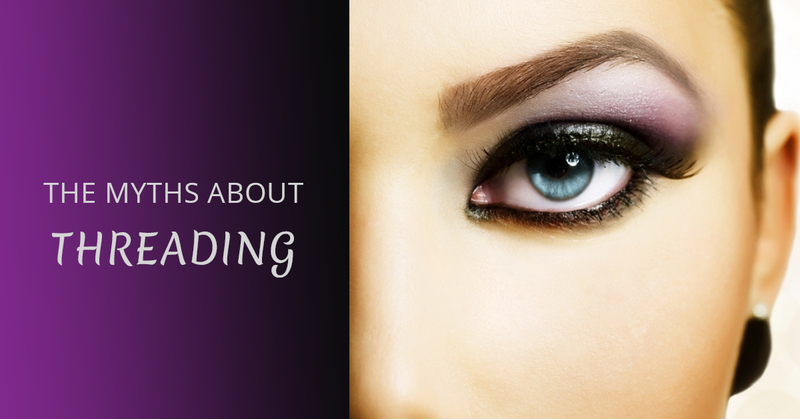 In today’s post, we will be debunking the main eyebrows myths you have most definitely heard. Hair grows back differently with different hair removal techniques such as waxing, plucking, and threading. When you are using these hair removal methods, the hair is being removed directly from the root. No matter what, your hair is being removed the exact same way with all three of these methods, so when it comes to regrowth of hair, one isn’t better than the other. However, each method has different aspects that make it unique. With threading, because we are removing hairs in a long line, it is the best way to get precise and perfectly shaped brows. Match your eyebrows to your hair color, always. While your mother may have told you this tip as a wee child, this is simply not true. Many people rock amazing eyebrows that are a shade or two off from their hair color. An example is many Asian women have beautiful jet black hair but would look silly with jet black eyebrows. Instead, they have a nice charcoal brown eyebrow to keep their face looking light and fresh. Many blonde women have darker brown brows for contrast and depth. The rule of thumb is to match your hair’s undertones- warm, neutral, or cool. Not sure about it all? Our salon is knowledgeable and can help with all your brow concerns. Hair removal above the eyebrow is a no-no. If this were true, most eyebrows would look sloppy and unfinished. Most of the shaping for the eyebrow does come from removing the hairs from underneath but that doesn’t mean you can’t remove any hairs from above. You do want to be cautious when you are plucking in between threadings, as plucking too much could result in a bad brow day. Your eyebrows aren’t going grow back after you got a little too pluck happy. While we don’t recommend plucking your hair till there is hardly any left, if you did on accident (you know those perfectionists) there is hope! Your eyebrows won’t be gone forever but statistics show that it takes about 50 days for tweezed hair to resurface. If you can’t wait that long, because honestly who could, you can get products to help produce eyebrow growth. This will increase the length of hair and will decrease the shedding phase. If you think this may happen to you, just come to the threading experts in the Garment District, you will be glad you did. If you are having an eyebrow crisis, or just need a touch-up, come to us at Unique Threading Salon. Our eyebrow technicians are professional, friendly, and are passionate about making you look like a fierce and confident woman with eyebrows that just won’t quit. Schedule your appointment today!